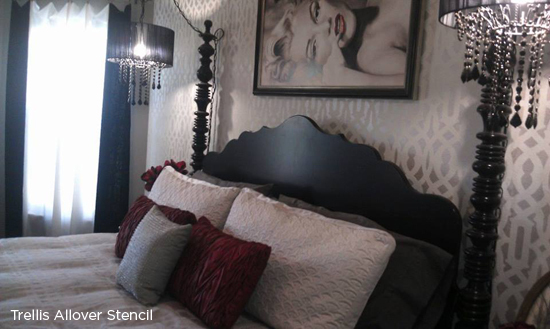 Here is Julie’s stenciled master bedroom. She recently created a stenciled feature wall using our Casablanca pattern in a metallic grey over flat grey. Gorgeous, right? 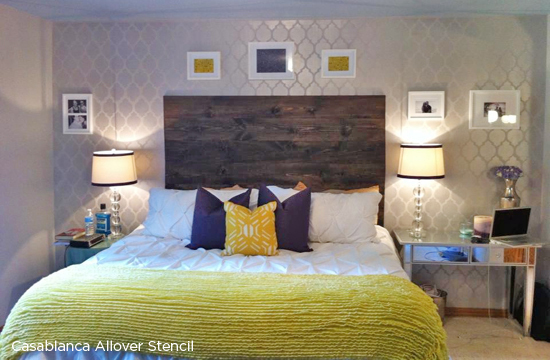 Then Kiri shared her Hollywood Glam master bedroom makeover using our Trellis Allover Stencil. She used Martha Stewart metallic paint in bone over navajo cream for her stenciled accent wall. All we can say is, simply perfection! Have you noticed a bit of trend yet? Besides the fact that more people are making over their boudoir’s to be extremely glamorous, we also see that metallic accent walls are HOT! Ready to be WOW’d some more? 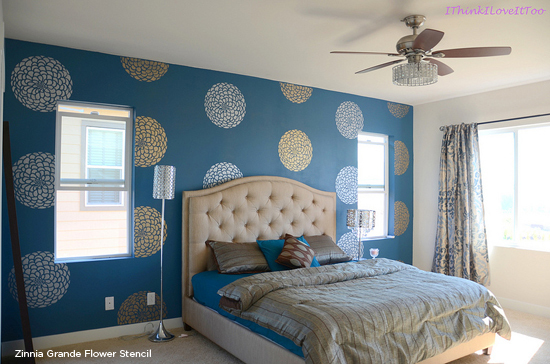 Let’s meet Sree, the home decor enthusiast/self proclaimed fashionista behind the blog I Think I Love It, and her newly revealed shimmery master bedroom makeover with a stenciled accent wall! It’s pretty jaw-dropping glamorous, don’t you think? She was in the process of decorating her new home and she had a short list of must haves on her bedroom makeover list. This list just happen to include a blue patterned accent wall. Sounds simple enough, right? That is until she scoured more than 1000 wallpaper patterns and found nothing. They were all too dark, too busy, too just not right. Well low and behold she discovered our FAB wall stencils. What’s so FAB? You can get it exactly the way you want it. She picked the Zinnia Grande Flower pattern she loved and mixed it with the paint colors that were perfect for her space. 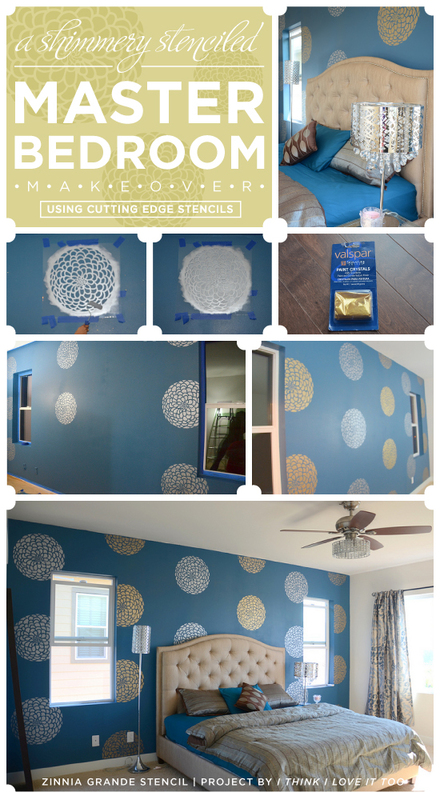 The end result is the perfect blue patterned accent wall for her master bedroom! Here she is working through the stenciling process. Sree used blue painters tape to adhere her stencil to the wall. This worked best in keeping the large flower stencil in place. Then she used a roller to paint the stencil pattern. She used a color similar to Benjamin Moore’s lucerne AF-530 to get this exquisite shade of rich royal blue for the base color of the wall. But wait a minute… Do you notice the little shimmer her wall seems to have? That’s because before she painted her wall blue she mixed in Valspar’s Granite Crystals. It’s pretty fabulous, huh? For the flower stencil she used Martha Stewart Accent Paint. And WAHLA! Here is the finished master bedroom. See I told you this bedroom was just downright GAWGEOUS! Sree says, “Out of all the rooms we decorated in our house, my bedroom is my favorite. It’s gorgeous!! Don’t you agree?” I think we’re going to have to agree on this one! PS. Are you loving the bedroom accessories in the blue master bedroom makeover? We’re also digging the fact that some of these could easily be recreated using stencils! 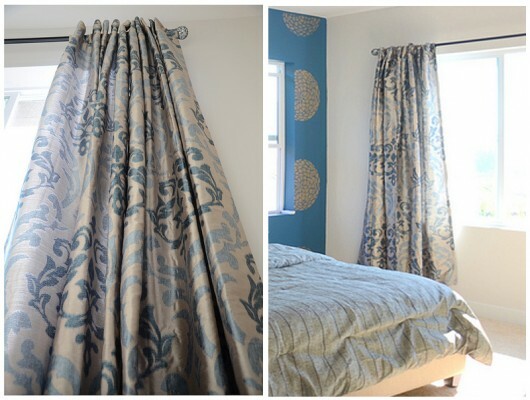 Like these gorgeous beige and blue damask curtains? Our Anna Damask Stencil would be just perfect for recreating this look! Would you glam up your bedroom with a stencil ? Leave us your thoughts in the comments below! 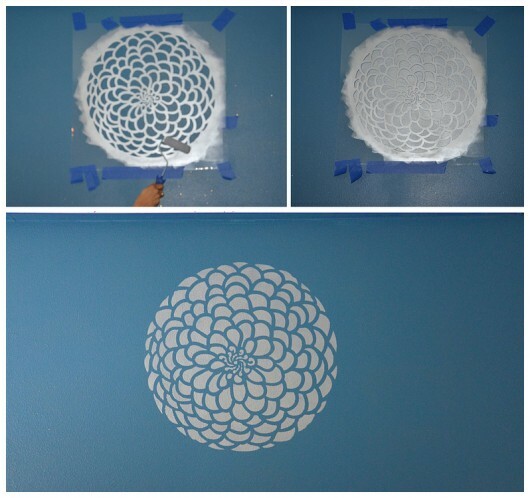 Buy a Zinnia Grande Stencil and glam up your space!